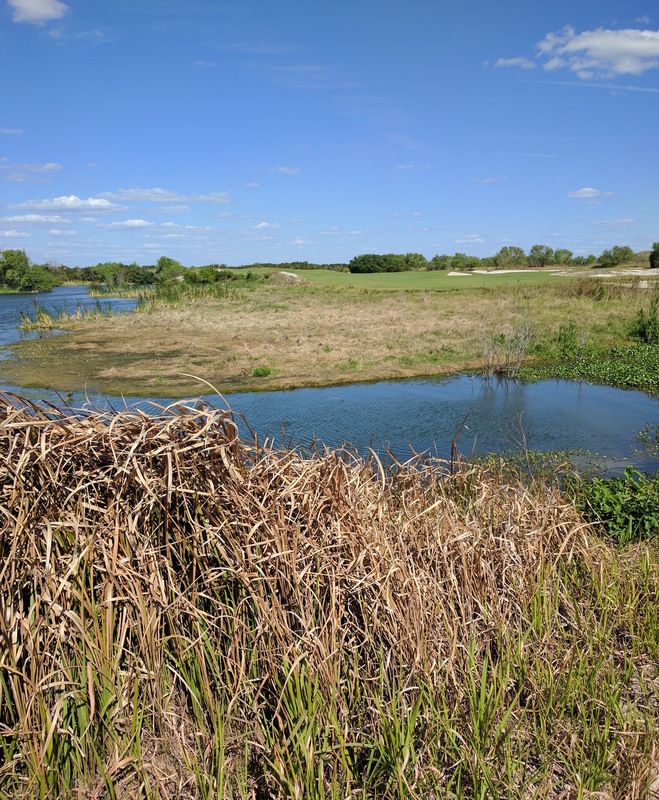 Part two of the Pocahontas themed review of Streamsong Golf Resort! If you’re just seeing this for the first time, I suggest you go back to part 1 and read that first so you can read about the Red course and how we spent the morning at Streamsong. With that being said, I’m going to just jump right into talking about the Blue course, the differences between Blue and Red, and then a bunch of pictures and descriptions of the holes out there! 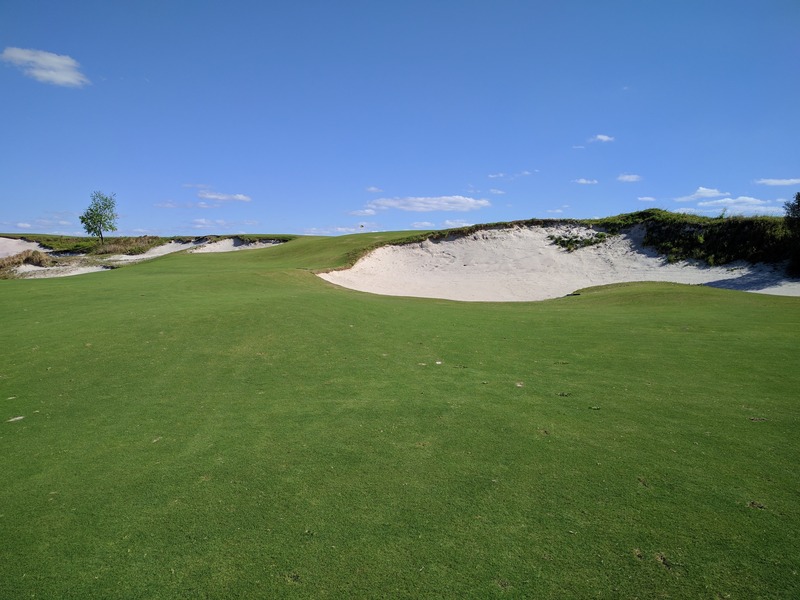 Part two of the review of Streamsong, this time Blue. Yes that sentence was meant to rhyme, and yes the course costs more than twenty thousand dimes, but when you have time, climb the hill to the Blue’s first tee, hit your drive and hit your approach shots carefully. We weren’t sure if we’d be able to play the Blue course in the afternoon after the Red due to the early sunset in March and how many groups had been teeing off that whole day. We checked with the guys at the pro shop who said we were pretty much free to hit the course when we were ready, but weren’t able to confirm we’d be able to finish before dark. After thinking about it, Mike and I headed out to the Blue course around 2:15 that afternoon. There are two main differences between the Red course and the Blue course. First, where the Red course had obstacles on the “safe” side of doglegs, the Blue course has wide open fairways. Thinking back, there are so few holes I can remember that literally don’t have fairways wide enough to catch every drive no matter how off center you hit it. I’d like to expand a little on this type of design. There’s actually a reason for this style of course – it forces golfers to strategize about where to hit each tee shot, as opposed to holes that are straightforward (pun intended). Furthermore, the wide open nature of this style gives poor players a chance to keep the ball in play. This applies to both fairways and greens. There were plenty of times where I drove the ball too far to the wrong spot on the fairway that I wasn’t going to be able to get the ball close to the pins. This whole explanation is summarized more succinctly by a quote from the famous Alister MacKenzie, most likely about Augusta National (MacKenzie designed, Jones owned). We wanted the fairways to be wide so that every class of player could find a way to navigate each hole. The good player should be able to create an attractive angle for his approach with a drive into the correct spot. And the lesser player should be able to easily achieve a bogey without any undue stress. This is exactly what I saw going on at the Blue course in terms of fairways — tons of holes with giant fairways that I was able to hit with crappy drives, but often made it incredibly tough to get the second shot close to the pin even if I was striking the ball perfectly. The Red had some holes like that as well, but the fairways were never close to as big as Blue’s. Second difference between the courses is how the Blue course’s greens differ from the Red’s. Blue greens were much more of a classic, somewhat circular look, but with slopes and dropoff areas that make it tough to get the ball close, bringing three putts into play, while I mentioned in part 1 that the Red course had a bunch of giant and multi part greens. Also speaking of MacKenzie quotes, here’s one about how long it takes to play golf. Golf courses are becoming far too long. Twenty years ago we played three rounds of golf a day and considered we had taken an interminably long time if we took more than two hours to play a round. Today it not infrequently takes over three hours. I have no issues with course length cause I like them being longer since I’m lucky enough to hit it pretty long, but give me those two hour rounds! Time for course description and pictures. Again, if you want more pictures only slightly more pretty, look at the hole by hole tour on Streamsong’s website. The first hole is a drivable par 4. From the tee box, you had a great view of a bunch of different holes on each course as well as the clubhouse. Hole 2 is a par 5 with a mini fairway that requires careful consideration. Due to how downwind it was when we played, I hit two 3 irons to get it near the green. Both holes 1 and 2 had plenty of safe room near the green, but it was difficult to get up and down which left me with pars on both. Holes 3 and 4 are both similar, uphill dogleg lefts with water to the left side of the fairways. Here’s the tee shot on 4, with bunkers on the safe side of the fairway that are ridiculously far to the right making the fairway really large, as discussed earlier. And here’s what the approach to that green looks like. Being uphill and having a hidden view of the green are two things that make close approaches difficult. Moving onto the 6th hole, another another drivable par 4 with the widest open fairway I’ve ever seen on a drivable par 4. This hole basically becomes a par 3.5 in a tournament setting. On the tee, you’re excited for a chance to make birdie, and should retire from golf permanently if you don’t. (Joke.) Having that mindset is key if you’re looking to score well.